The American Historical Theatre - We Entertain, We Educate, We Inspire! Founded in 1992 (AHT) is a 501(c)(3) organization. Our Actor/Historians educate, entertain and inspire through Living History. For more than 25 years, our first person interpreters have encouraged audience members to encounter and interact with history, developing empathy and underscoring the role of choice. We hope that by creating a better understanding of the struggles and achievements of past generations, we can inspire the present to use these lessons and create a better history for the future. Presentations are available for all levels of education, interest, and requirement. School programs enhance curriculum points; General Interest programs for Museums, Libraries, and Historical Societies; Specific interest groups such as Lineage and Genealogical Associations; Customized Scripted programs for Special Occasions, Team Building exercises; Key-note Addresses for Corporate and Government Entities including Continuing Legal Education seminars. Law-firm and Judges retreats. Credits include: The White House, The National Archives (DC and NYC), The Nixon and Regan Libraries, The National Park Service, The Smithsonian Institute (Museums and Educational programming), UNESCO, Humanities Councils, Schools, Museums, Libraries, and cultural/historical institutions across the country. Founders William and Pamela Sommerfield began with a teaching philosophy that rests on interactive, experiential learning. 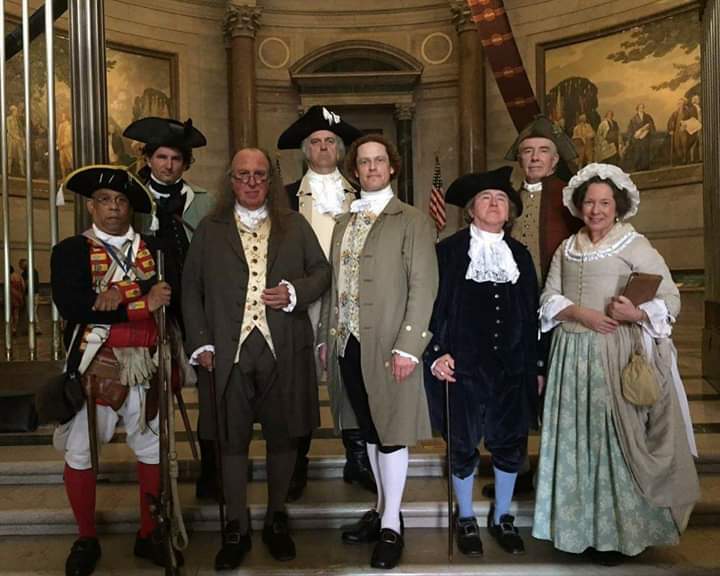 Actor/Historians travel to historic sites and museums, businesses, schools and special events all over the world where audiences benefit from the company’s focused dedication to the fine art of historical interpretation. AHT’s Actor/Historians offer authentic theatrical performances, dynamic workshops and programs using original scripts and spontaneous interaction with the audience, to bring to life beloved honorable men and women from the past. AHT carefully researches and investigates each of its characters, and all parts are cast with adherence to portraits, accurate historical costuming and comprehensive knowledge of the character. This dedication to historic detail allows Actor/Historians to interact and answer questions from audiences as well. Currently, the hundreds of programs and plays created through the American Historical Theatre bring the Nation’s most interesting and important historical figures to life, educating and entertaining audiences all over the Nation.